When you intend to use a chainsaw, it's important to check the work area for hazards before you start felling or cutting. Obviously, you'll never deliberately do any anything that will harm another person when you are using your chainsaw but you do need to be mindful. Last year I was chopping up some branches my neighbor himself had cut down and thrown over the fence for me to use as firewood. I happened to run out of fuel and the saw cut out. I put it down in front of me and that's when I realized my two year old daughter was standing just me. Gave me a hell of a fright with the realization that a kick back or an odd movement from myself could have put her in harm's way. It appears I did not shut the back door of the house properly. Did I think to do so? I can't recall, but either way, I wasn't mindful enough to check my working zone would be safe. So I know personally this is no joke, and you do too, that's why you're here, looking for safety zone advice. Check that there are no (or will be) no people or animals in your work zone. Tell people around you to stay clear and ask mums or dads to keep the kids inside. Ensure you have a clear work area in which you have a stable footing and do not have to reach or work off balance. Make ladder adjustments as necessary and have a support person as required. Shut down the chainsaw off before carrying it. Carry it by the front handle with the bar to the rear - not balancing on your shoulders mate! 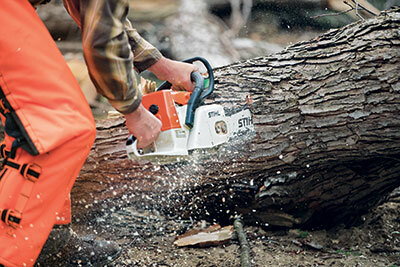 If you are felling trees, make sure other people are at least two tree lengths away. Before you commence cutting, determine your escape route escape route, one that is cleared to the side and rear. Check for hazards in the area - such as electricity or telecommunication cables. If in doubt, seek advice from the local controlling authority.